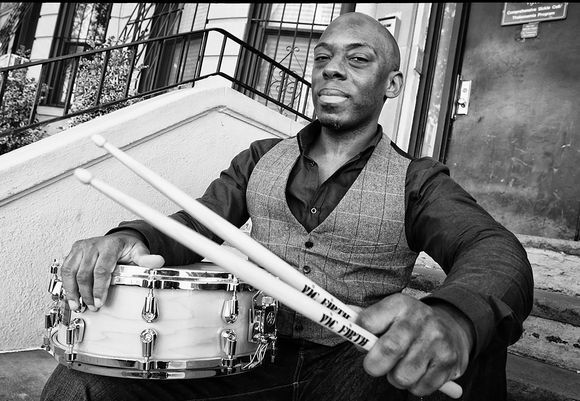 Enoch Jamal “E.J.” Strickland is the world-class, world-traveled drummer, composer, educator, and artist you’ve heard on over 60 albums in the last 10-plus years. The Miami native grew up in a creative household, where his dad was a percussionist in the Ft. Lauderdale Orchestra; his twin brother Marcus played the saxophone; and where E.J. beat on pots, pans, and tables until he finally got his hands on the drums. He was only in middle school, yet E.J. knew then that jazz was his calling. Where does one go as a young jazz musician, serious about the work? New York City, of course. Like so many talented artists before him, E.J. chose the New School to further his jazz education, a course of study that would introduce him to greater technical ability, but really, to the meat of any jazz program: teachers and peers. Reggie Workman. Buster Williams. Billy Harper—just to name a few of the living legend, caring instructors who guided E.J. during his tenure. And the peers? Friends who would spend almost every moment together, growing as young musicians and future leaders of the sound: Mike Moreno, Robert Glasper, Brandon Owens, and Marcus Baylor. Together, they formed a group that would shape their voices, and establish their careers. E.J. quickly graduated into New York’s gigging jazz scene, playing early on with Russell Malone and Ravi Coltrane. Both artists proved to be big brother types for E.J., gently guiding him as he established his voice. “Russell really stressed the point that as a drummer, you’re supposed to make the music feel good,” he says. “I always try to remember what he instilled in me.” Ravi Coltrane lent a similar kind of open-ended guidance, telling E.J. to simply “find something” in the music. Just what that would be was up to him. Since then, Strickland has built a successful career as a composer, bandleader, educator, and sideman. He’s toured, performed, and recorded with some of the greatest names in contemporary music: Cassandra Wilson, Terence Blanchard, Lizz Wright, Wynton Marsalis, George Colligan, David Gilmore, Vincent Herring, and Nnenna Freelon, to name a few. As an instructor, he’s taught alongside some of the world’s best jazz educators: Dave Douglas and Vijay Iyer at the prestigious Banff International Workshop in Jazz & Creative Music, Steve Kirby at University of Manitoba, and Earl MacDonald at University of Connecticut. In 2015, E.J. brings his eclecticism to a new group, Transient Beings. Founded in the spirit of the present moment, Transient Beings celebrates the one thing we all share: limited time on Earth. With insightful and uplifting lyrics, and a unique instrumentation—vocals and effects by Sarah Elizabeth Charles, two guitarists, Nir Felder and Tom Guarna, Rashaan Carter on electric bass, and Strickland pulsing throughout—he hopes to unite his listeners through funk, hip-hop, Afrobeat, and fusion, pairing the complexity of jazz solos with the textured guitar sounds of rock. Enoch Jamal “E.J.” Strickland is the world-class, world-traveled drummer, composer, and bandleader you’ve heard on over 60 albums for over 10 years. The Miami native and twin brother of saxophonist Marcus Strickland is a pillar of the New York jazz scene, having lent his eclectic sound to albums by Ravi Coltrane, Russell Malone, and others. Influenced by Latin, Afro-beat, hip-hop, and tribal music, he’s a multifaceted performer and composer, none so apparent as on In This Day, his debut album. Featuring the E.J. Strickland Quintet, the album is deepened in tone and texture by its guest appearances: from its traditional horn players, to the unique choices of harpist, hand percussionists, and spoken word poet. Armed with the power and complexity of his sound, E.J. Strickland continues to clear a path for himself in the jazz world, and beyond—a path that can only grow wider in the years to come.